Sour cherries. Photo courtesy Baldor Foods. This is Page 3 of a four-page article. Click on the black links below to visit other pages. Always buy completely ripe cherries. Unlike other stone fruits, cherries do not ripen off the tree. Look for cherries that are plump and brightly colored; avoid those with blemishes, or those which feel hard to the touch. 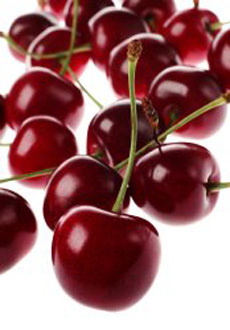 Cherries are highly perishable: Their shelf life is about four days in the refrigerator. Use them promptly, or they will rot. Cherries can be frozen; this is a good way to preserve both the fruit and its juice. Do not defrost cherries before using them to cook or bake, or you risk losing some of their succulent juice. As with many plants in the Rosaceae family (including the apricot and the Japanese plum), cherry leaves are poisonous and should not be eaten. Cherry juice is renowned for its ability to stain hands, table linens and clothing. For stained hands, rub lemon juice over the affected areas and rinse well with warm water. For fabric, apply a commercial brand of stain remover directly to the stained portion of the material, follow directions and repeat as necessary.